We do get spring here too, but not for a couple of months. So in the meantime, let's looks at some of my garden photos from last year featuring succulents. 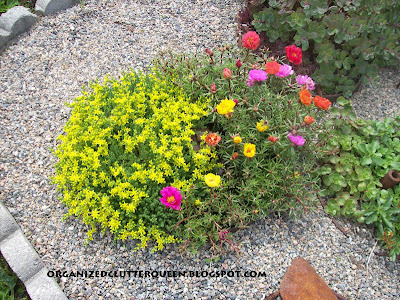 Succulents hardy for my area, include hens and chicks, and a variety of tall and sprawling sedums in an array of colors. 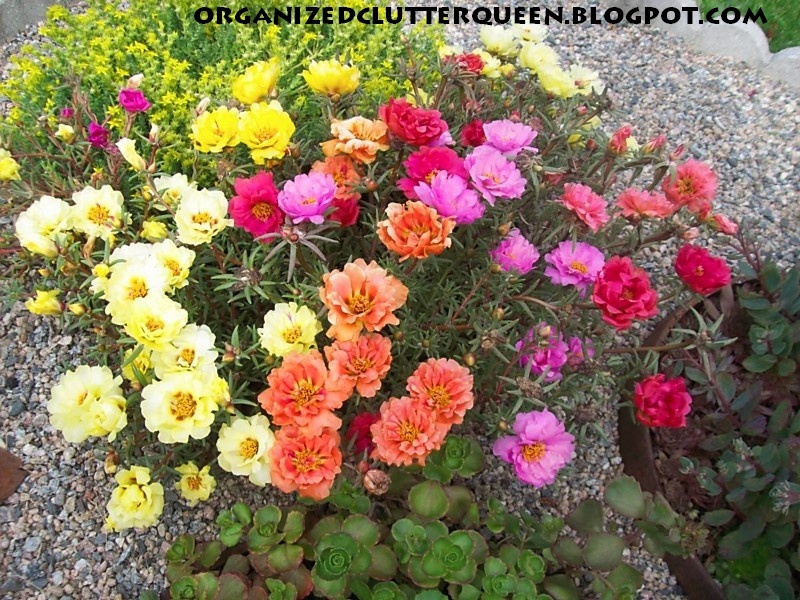 The annual, moss roses, would also fall into the succulent category. 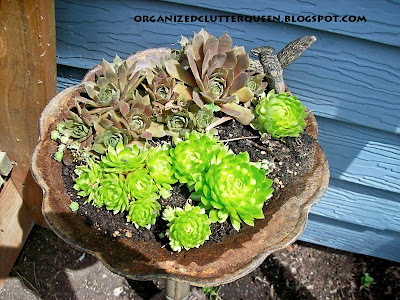 Since succulents take high heat, not much soil, and little water, they are perfect candidates for some garden art. 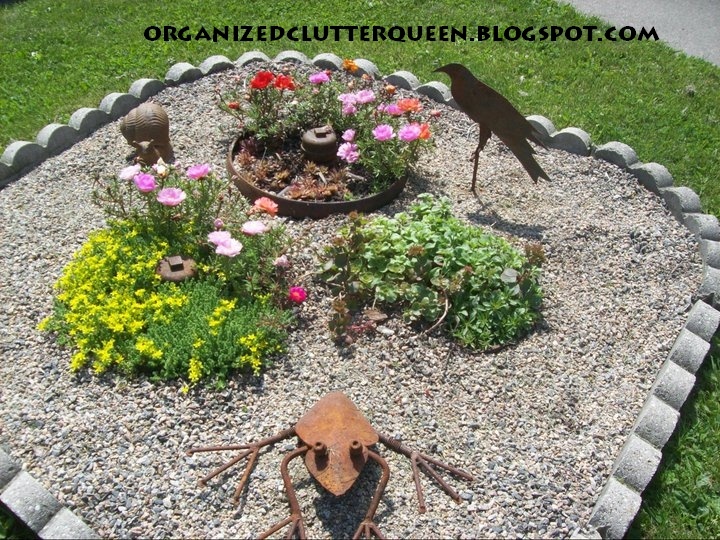 This is an old iron bird bath. I didn't cut any holes in it so it sits under my eaves and gets watered sparingly. This is the side of my deck. 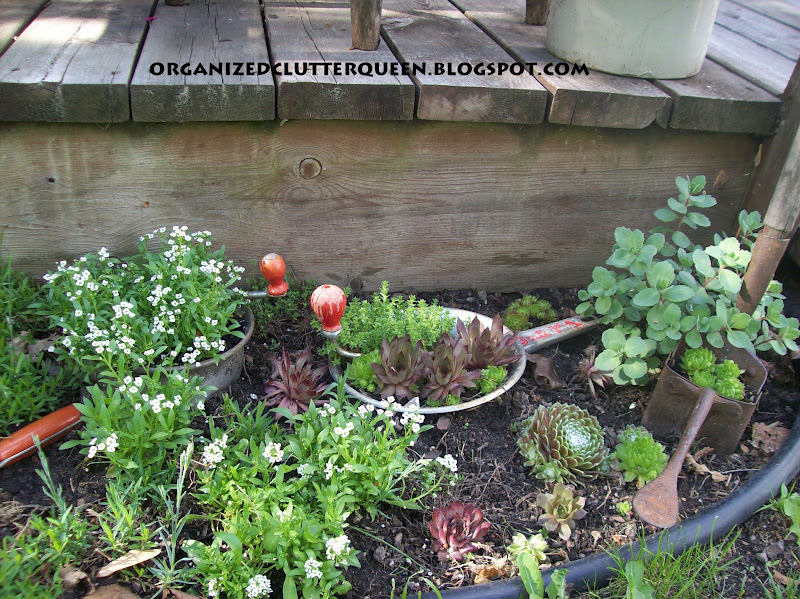 On the far right I have a little vignette of kitchen and farm tools with hens and chicks and sedum and alyssum. 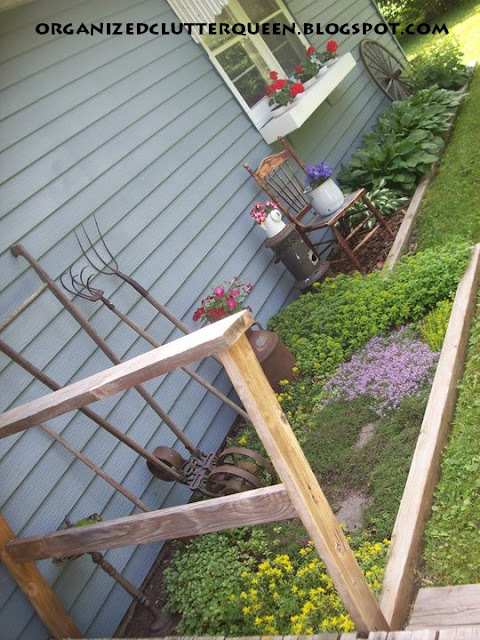 Close up of the outdoor vignette, with ricers, and old planter. This is also next to my deck, mostly sedums, and two types of thyme. 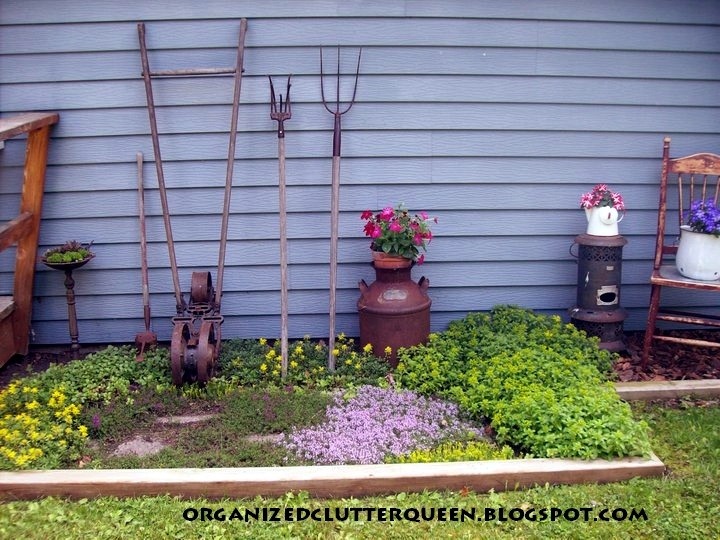 Also an outdoor vignette with old farm tools. The view stepping off the deck. 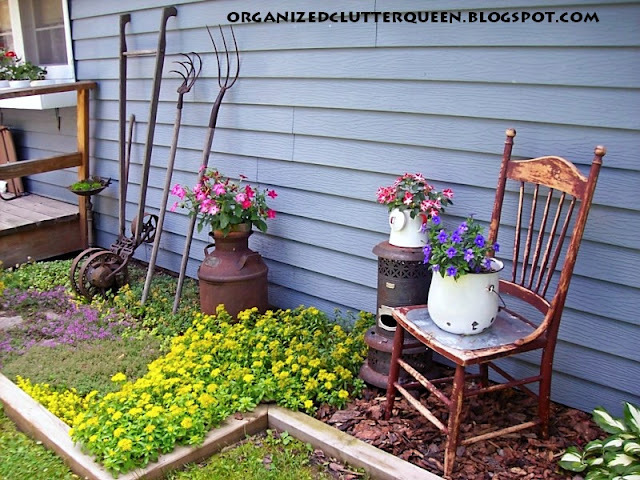 Another view that includes a chippy chair, old kerosene heater with coffee pot impatiens, and browalia in a enamelware pot. This garden has succulents planted in three metal wheels and is surrounded by pea gravel. It was a banner year for moss roses. The wheel, succulent garden in early summer. More of the wheel/succulent garden. It all looks great. We're getting snowed on right now, so I know what you mean. :) I hope spring comes soon for you! Love your beautiful garden. So glad to have found you at the Newbie party. Hope you'll stop by my blog sometime. Carlene you have a gorgeous garden. I love succulents too, they are so hardy and add so much texture. Thanks for sharing with my newbie party. Following you via Debbiedoo's. 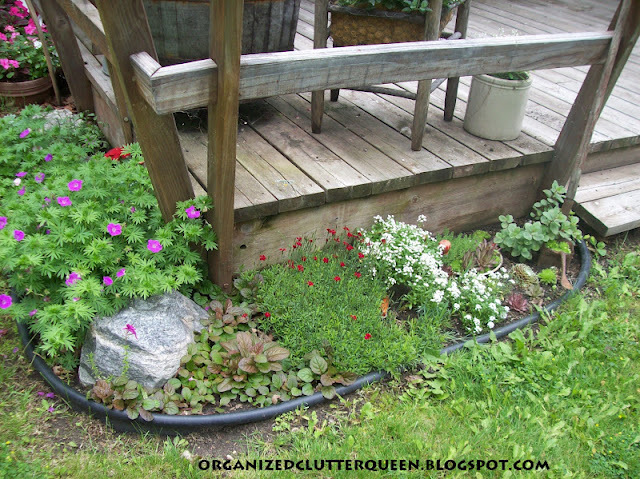 Love your garden!! I am so anxious for spring....so much to do! Hi, I found you on Debbiedoo's great job on your garden. I'm a new follower would appreciate the same from you. Do the succulents live outside all year and bloom again or do you need to purchase new plants every year or do you take them inside during the winter? I have no clue. I envy you having a proper garden, I live in South Florida and we have basically sand with a thin layer of soil. So I have long given up on anything other than palms etc. Loved seeing your flowers, Maureen.